iSnow Makes Sure That You're Always Prepared For A Snowball Fight | OhGizmo! Do you guys remember that comic strip where Calvin saved up a snowball all summer, just so he could throw it at Susie? Well unfortunately saving up a snowball for any length of time is a difficult task. I believe my one attempt as a child was quickly foiled by my parents, as they knew exactly what I was up to. Though I haven’t had to worry about my parents going through my freezer for some time, I haven’t tried saving back a snowball again. Thankfully, modern science allows us to have snow whenever we want it, even without some large machine. 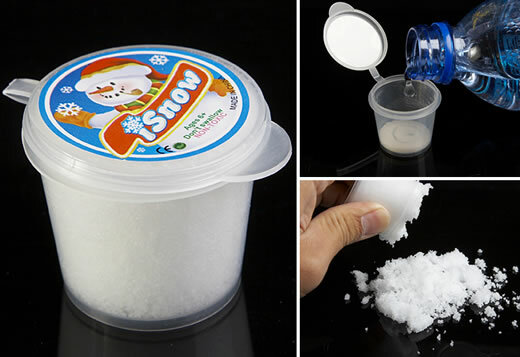 iSnow is a non-toxic polymer material which can be used to create artificial snow. Just add a bit of water, and you’ll be ready for a (very small) snowball fight in no time. The material is reusable, so you can create snowballs over and over again, provided you scoop up the remains and keep them safe. Just $4 gets you a set of five iSnow kits. That's just sodium polyacrelyate. Sold for pennies an ounce. Any science/lab supply shop will have it at drastically un-gimmicky prices.